Dresden Sawyer is a registered Xseries meta citing an abnormal blood diet and the ability to shapeshift invasively into his clothing as well as changing basic physiology. Currently subject exhibits MIDIAN dna with strains of LEECHES, MOSQUITOS, and CROW. The ministry of Occult along wit the Lousiana Medical community were among those who sponsored a reccomendation for Sawyer's Transfer. 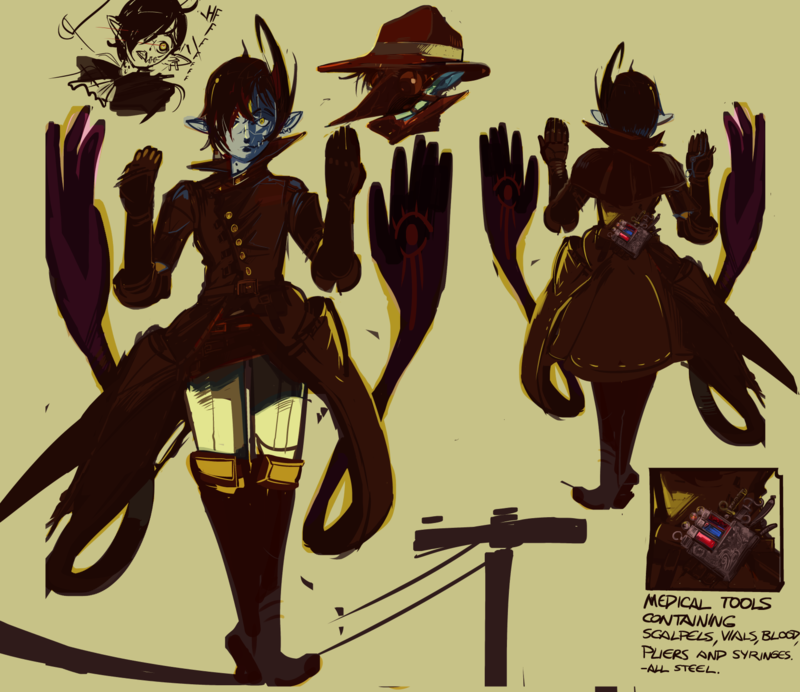 Though a free agent in the medical community, subject works the open market dispensing medical services for other X-series metas and offers expert services on Occult consultation sometimes for the meager price of a voluntary blood transfusion to sustain his archaic lifestyle. Midians are so called for their connection with a biblical peoples in an ancient city of Midia long buried by an earthquake with its residents written off as dead. History would later prove however that the people of Midia did not disappear but instead evolved into what we know today as Vampires. Dresden Sawyer was so named due to his siring in the late 18th century in the Americas and since then has maneuvered in Occult communities and acted as a civic servant., witch, teacher, scientist ,and even vampire hunter [in service of the Allies] before settling down to his self made profession of Occult Practitioner where he has collected over a hundred thousand blood samples as payment for his services and likely assimilated in his system but failed to show in surprise medical tests. Dresden Sawyer remains a civic servant to this day and in Void does not escalate beyond what is necessary in a violent conflict. However more than one agent is needed to keep track of his threat data as his meta classification ranks him as an infectious vector but does little to avail him in ranked engagements with other Fighters over class B threat ranges. Subject displays a willingness to perform in everyday society as a Doctor, Battle has cleared him for A class Housing , and a greenlight into the VCP Investigative branch. However in light of rejecting these offers, his threat level has stagnated at C and will go no lower. He uses a wide range of medical skills both conventional and strange and applies a majority of them in the field with improvised gadgets and concoctions. Due to his genetic traits as a midian he operates at a rate faster than modern day robotic surgeons. In terms of diagnosis a long track record, combined with good senses and perception has availed him many times over alone. Dresden's experience as a field surgeon has allowed him to perform unprecedented procedures that continues to breach Ethics discussions despite the fact that his license is not recognized by the medical board of the Continental Government.